Reggie Fields Lawn Cutting Service Maple Heights, Ohio business becomes local favorite after neighbor complaint on 12 year old black boy backfires. 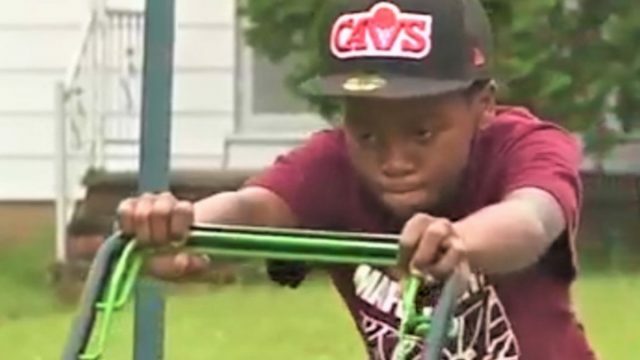 Disconcert has come to the fore after an Ohio neighbor called police to report a 12 year old black boy ‘trespassing’ after inadvertently mowing their side of the lawn while working on another neighbor’s front lawn. The incident follows Reginald ‘Reggie’ Fields having spent the summer mowing multiple lawns as a way to pick up cash at his local Maple Heights neighborhood. The young boy, helped by his siblings and cousins, had agreed to cut the grass for Lucille Holt but accidentally crossed over into her neighbor’s front yard. The yards are not separated, but run on from each other making it difficult to see where one lawn begins, and another ends. Rather than (presumably) be delighted with the free lawn trim, the neighbors instead called 911. Holt said that the kids had been minding their own business, mowing the lawn, when they accidentally strayed into the neighbor’s yard. She added that most people would be pleased to see kids developing a good work ethic, and staying off the streets. Recalled Holt, ‘They should be glad these kids aren’t here breaking their cars windows out. They should be glad they aren’t here stealing their cars. Holt added that her ‘troublesome’ neighbors would call the police at the drop of a hat. Maple Heights Police Department, Lt. Joe Mocsiran said an officer responded but no action was taken against Reggie or his relatives. ‘They said I was cutting their grass. I didn’t know it,’ Reggie, who runs Mr. Reggie’s Lawn Cutting Service, told WPTV. Holt’s video led to many condemned the neighbor for calling the cops on ‘hard working young kids’ and wasting the police’s time, while others wondered whether police would have been called in the first place if Reggie had been white. While Reginald Fields may have been unnecessarily put out, the 12 year old concedes the incident since leading to his business booming. People from all over the neighborhood are asking him to mow their lawns, and the family have also received donations of gardening equipment to expand the business, and make their job a little easier. ‘People are inboxing me like, ‘how can I get in touch with these children? Where are they at? I got property I want these kids to cut,’‘ Holt said in since posted youtube video.